Home » About Indonesia » 50 Cheap Things to Do in Bogor – The Best Tourist Site in West Java! Here we go again in the allindonesiatourism.com, all about Indonesia site. If allindonesiatourism.com has discussed some articles like best Japanese restaurants in Grand Indonesia, best restaurants in Solo Indonesia, and cheap Indian restaurants in Jakarta, in this occasion, allindonesiatourism.com will talk about some best place with cheap cost to be visited in Bogor, West Java. But before we start talk about it, don’t forget to read other articles from this site: best Chinese restaurants in Surabaya & best restaurants in Plaza Indonesia. 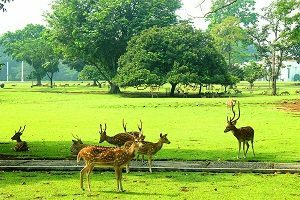 Kebun Raya Bogor is one of the most well-known tourist attractions in Bogor. Its area is 87 hectares, besides it has various plants. It’s about 15.000 plant species in this botanical garden. You can feel the fresh air in this area. Don’t worry about this vast place, there is a signboard at the entrance gate so you can easily get to the place you want. You just need to pay Rp 15.000 for domestic tourist and Rp 25.000 for foreign tourist for the sake of entering this place. If you want to ride 4 tires vehicle for looking around, you have to pay Rp 30.000 or you can ride the bicycle instead with Rp 5.000 for the payment. If you want to take any other holiday plans, you can visit Morami Falls in Kendari as a place that must be visited. Zoologi museum is a museum that saves various of preserved specimen collection or fossil of kinds animals. It is located in Jl. Ir. H. Juanda No.9. Up to now, it has 24 rooms. Its collections are mammals, birds, fishes, amphibians, insects, invertebrates, almost all over the preserved specimen type and the animals fossil can be found at this museum. Etnobotani museum is situated in Jl. Ir. H. Juanda No. 22-24, it is close enough to Zoologi Museum. Etnobotani comes from two words, Ethnology means science that study about culture; and botany means science that study about plants. Then, Ethnobotany is the science that study about the relationship between human and plants. You can see the miscellaneous of Bogor pictures on 1920’s or 1930’s in this museum. Some of its collections are batik that made from natural dyes, besides there are some rooms consist of spice room, Tempo Doeloe work room, spice history room, and green gold archipelago room. At the end of the room, there are a number of booths present kinds of the product of crossing tubers and you can also see various batik. In addition to plants, there is also a collection of various kinds of regional handicrafts which are made from rattan materials such as fishing equipment, musical instruments, and tools used on a daily basis. And you can also find various articles made from plants. Don’t worry about budget problems to enter this place, because it is free! Talaga Malimping tourist attraction is one of objects located in Ciades village, Kecamatan Cigompong, Kabupaten Bogor. Various facilities are provided for the visitors, start from gazebo, fishing place, music studio, tent, inn, culinary, and etc. With that complete facilities make the visitors feel comfort on their holiday here. For the sake of entering this place you have to pay Rp 2.500/person not including the game fees. Each game has its certain cost which is definitely inexpensive. Taman Wisata Mekarsari is a family tourist attraction for gardening. Start from fruits, vegetables, flowers, and ornamental garden are provided here. Taman Wisata Mekarsari is located in Cileungsi Jonggol, Kabupaten Bogor. It has complete facilities so this place is suitable as a place for family recreation. The entrance ticket is Rp 25.000 for weekday till weekend and Rp 30.000/person for national holiday. The ticket that offered are different depending on which packet we will take. Come to Mekarsari immediately when it is holiday! Bukit Alessano located in Cijeruk, Bogor. No one officially manages this site so far, so there is no official fee to enter this place. The facilities are still in developing process. This place is very suitable for the nature lovers, because it is one of camping site that must be visited. Bidadari falls located in Sentul, Bogor. This place is surrounded by Salak and Mas mount. Bidadari fallls opens at 08.00 a.m WIB and the entrance fee is Rp 30.000/person and Rp 5.000 for parking fee. After paying the entrance fee, you have to walk to the falls. Many beautiful views are offered, such as hills, fields, and the outlook of Salak mount. 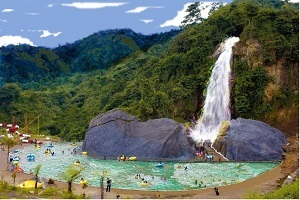 The swimming pool facility is provided in this site with the water that come from that Bidadari Falls. Many games are available such as flying fox and another water games. What are you waiting for? Come here immediately! Pancar mount located in Citeureup, Kabupaten Bogor. You can enjoy the beauty of pine forest and the mild weather of this place. This place is very suitable to be used for holiday place to get rid of the work fatigue and the boisterous big city life. There is a cafe with the nature nuance available inside the pine forest. Besides used for camping site, this place is also used for pre-wedding. Another facility from this Pancar Mount is warm bathing pool. Curug Kapas located in Jl. 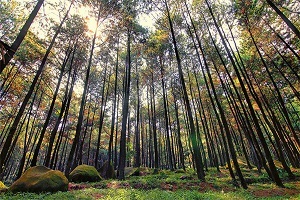 Gunungwangun, Cibadak, Bogor. This curug has the very clear water. To enter this place you just have to pay Rp 15.000/person. Invite your friend and family to enjoy the beauty of this Curug Kapas. Kampung Budaya Sindangbarang located in Kecamatan Tamansari, Bogor. This place is the oldest villages in Bogor. A long time ago there is Sindangbarang Kingdom. There are 8 Sundanese art here and once a year is held Seren Taun traditional ceremony. This place is suitable to be visited for conserving Indonesian culture. For those of you who have a photography hobby, you must come to this tree house because it has beautiful photo spot. This tree house is situated in Pabangon Village. With the magnificent view and very cheap entrance ticket which is Rp 5.000/person, make you have to visit this place. This place is appropriate for you to visit in your weekend, and this place is the most unique and very suitable for you who are very contemporary. With the standard entrance fee which is inexpensive, you can get the tourist attraction that related to the nature. Taman Wisata Matahari has many games such as flying fox, ATV adventure, mini out-bond, and so on. Taman Wisata Matahari located in Puncak, Bogor. To enter this tourist attraction you have to pay only Rp 15.000/person not including the game fees. Situ Gede sit on Situgede, Bogor. There is the research center of the forestry in this Situgede because there are many natural forests here. This place is very appropriate for those of you who have a fishing hobby. Don’t worry about the budget problem, you only have to pay Rp 4.000/person to enter this tourist attraction. Pura Parahyangan is the biggest temples in Java. This temple is built on 1995 and is the place for holding Hindu religious rituals. The natural beauty is served along the trip to Pura Parahyangan. There are some regulations for obeying by you whilst you are visiting this temple. Eco Park Ah Poong is situated in Sentul, Bogor. Its concept is similar to Pasar Apung’s. Kinds of foods are provided start from the Sundanese typical cuisine, the Javanese’s, till the another dessert drinks. You can enjoy to eat on the boat or in the common place. For the transaction, you must have the specific card for purchasing process. Visit this place immediately! Kebun Raya Cibodas is one of the cheap tourist attraction option in Bogor. It is sit on the foot of Gede Pangrango mount. There is a small lake and various plants in this tourist attraction. The mild air and the beautiful view make us comfortable to be on vacation here. This place is very appropriate for doing outdoor activities such as camping, out-bond, and so on. This place is very familiar, you can visit it with your friends or family. With the standard entrance fee which is cheap, you can enjoy the very green nature atmosphere and can calm your mind. Little Venice is located in Puncak, Bogor. This place offers various games such as gondola, rubber boat, Mississippi Boat, and so on. This place is often used for pre-wedding photo spot, the entrance fee starts from Rp 25.000 to Rp 35.000 for games. This place is nature preserve which consists of various of protected flora and fauna. It is sit on Citalahab, Bogor. There are facilities available such as mount bike trekking, hot water bath, and falls. Visit it soon! You must visit this place when you come to Bogor. It is located in Halimun Mount, Loji Village, Cigombong. You need extra struggle to get there because you will pass the rocks road. But don’t worry, your struggle will be paid with the enchanting beauty of nature from this eagle sanctuary. Curug Leuwi Lieuk is one of nature objects that has enchanting beauty. This is a very famous and cheap natural tourism. That’s all the 50 Cheap Things to do in Bogor – The Best Tourist Site in West Java! Remember to keep your health and check your vehicle when you are on trip to out of town. Hopefully this article can help you to look for tourist attractions in Bogor. Happy vacation!